If you see more than one disk in the Storage area of System Information, your internal disk has multiple volumes. 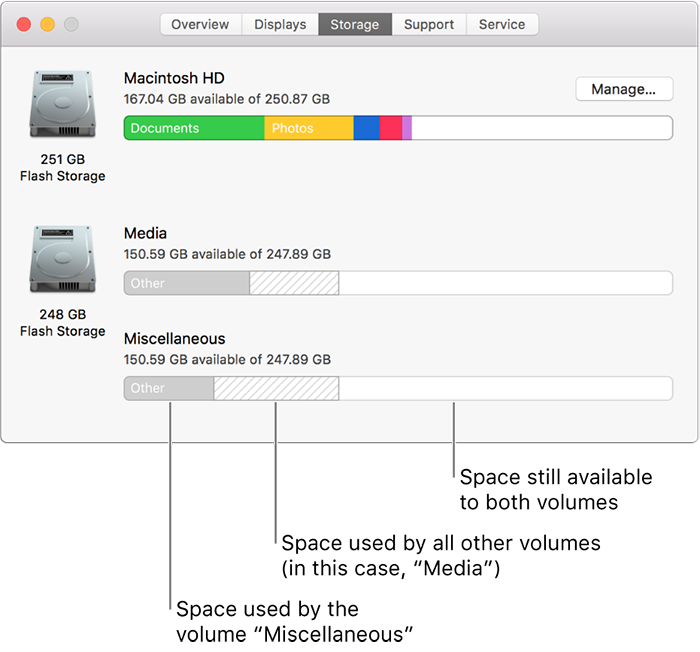 macOS Mojave uses a file system called Apple File System (APFS), which allows space to be shared between volumes on a disk. If a single APFS partition (or container) has multiple volumes, the container’s free space is shared and can be allocated to any of the volumes as needed. Each volume uses only part of the overall container, so the available space (shown in white in the illustration above) is the total size of the container, minus the size of all volumes in the container. This overall amount of used space, including other volumes in the container, is indicated by a cross-hatched area. To learn more about partitions, see Partition a physical disk.